Perfect for a sea side venue, a destination wedding or for those who love boating, our Nautical Themed Anchor Bottle Stopper favors are sure to be a treasured gift. Each stylish bottle stopper features an anchor charm that is detailed with a rope winding down from the top of the favor. The conical stainless steel stopper is complete with a black rubber gasket for a tight seal. White organza ribbon and 'For You' message with anchor card is included. Each measures 4 1/4" x 1 1/4". Packaged in nautical design blue and white stripe bottom box with a clear acetate top. Inside stage has matching blue and white stripes. Brides (young and old) tell us "this was a great favor for our beach wedding" and it "was a classy gift to put out at every place setting". They felt it was "a great value for the price" and the best part was "guys loved this gift as much as the girl, it was manly enough, all the guys took it home". Others were happy that "shipping was quick" and "customer service made me feel comfortable that I was buying something that fit my wedding theme." This is the Nautical-Themed Anchor Bottle Stopper by Fashioncraft. 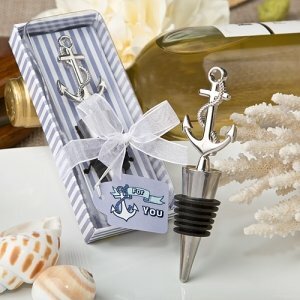 It is a perfect wedding favor for that nautical-themed wedding. It comes nicely packaged, as you can see, in this lovely box, with a beautiful sheer ribbon and a little tag, 'For You'. You open it up. Oh, it's secured in there, so I'm just gonna slide the ribbon off. You open it up, covered by this durable plastic to protect it. And the bottle stopper is secured into its packaging. Nice, high quality metal on top. And you can see it's intricately designed and just made of a very high quality material, and perfect for that nautical-themed wedding. Can I get a sample of the anchor bottle stop? Yes, you may order a sample of the Nautical Themed Anchor Bottle Stopper at a special price of $1.34. Just enter 1 in the quantity box then add it to your cart and complete the check out.